In 2013, Rock in Rio sold out all 600,000 tickets in an unprecedented four hours. 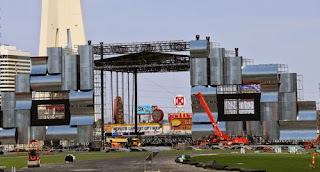 Rock in Rio USA comes to Las Vegas on May 8-9 and 15-16, 2015. One weekend will be dedicated to rock and the other to pop music. This legendary festival broke records since 1985 in its first event --with 1.38 million attendees--five times larger than Woodstock. Today, Rock in Rio has hosted 14 festivals in 3 countries, with more than 7.4 million people attending and 1 billion watching around the world. In 2013, Rock in Rio sold out all 600,000 tickets in an unprecedented four hours. RockinRio is also the world's biggest music festival on facebook with over 10 million followers. On a scale that Las Vegas has never seen, Rock in Rio will build a permanent open air venue - "The City of Rock," which will be equipped to receive 85,000 people per day. Rock in Rio USA will feature six stages, streetscapes representing Brazil, U.S.A. and the U.K., a ferris wheel, a zip line, a VIP area and more than 100 performances in 6 stages.